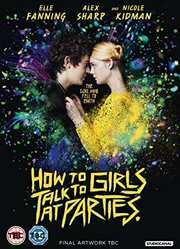 From the visionary minds of writer Neil Gaiman and director John Cameron Mitchell (Hedwig and the Angry Inch, Shortbus) comes a story of the birth of punk, the exuberance of first love, and the universe’s greatest mystery of all: HOW TO TALK TO GIRLS AT PARTIES. Enn (Alex Sharp) is a shy suburban London teenager in 1977, sneaking out with his best friends to after-hours punk parties. One night they stumble upon a bizarre gathering of teenagers who seem like they are from another planet. In fact, they are from another planet, visiting Earth to complete a mysterious rite of passage. That doesn't stop Enn from falling madly in love with Zan (Elle Fanning), a beautiful and rebellious alien teenager who, despite her allegiance to her strange colony, is fascinated by Enn. Together they embark on a delirious adventure through the kinetic punk rock world of 1970s London, inadvertently setting off a series of events that will lead to the ultimate showdown of punks vs. aliens, and test the limits of how far each of them will go for true love.